You may not have time to take care of them. That you have no skill. That your house is not bright enough so that the plants you want to place in it are always well. 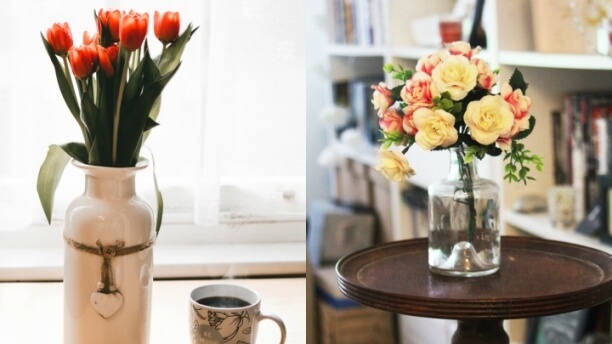 The solution is simple: you need artificial flowers in your decoration. Banish from your head that image of artificial plants and flowers without any charm. Now there are very cool options for it, they seem almost natural and the effect they provide is very beautiful. And without the need for any kind of effort! Today I tell you several ideas to introduce them in your decoration and forget about watering, fertilizing or transplanting. We start with a classic. A vase with flowers. Who says vase says glass bottle, ceramic jug or any other container that you like? As you do not need water, you have many alternatives to search for in the design of an ideal decoration. It is a very colorful detail perfect for any corner. You only have to think about the colors you want for your flowers and the container you will use and you will have a very special floral decoration. The kitchen is one of those spaces in which we like to add decorative details. And the flowers and plants are amazing there. If you do not want them to suffer from fumes and smells, the option of placing an artificial arrangement earns a lot of points. You can choose some green plants, for example, or some colorful flowers to add a very cheerful touch to this space. If you work at home and you like to pay attention to your office, I recommend you that include a plant. The ideal would be to have enough light to be natural, since the energy that they projected is very good in this place. But if not, you can also introduce artificial elements that help you to colorize your work space. It had gone the belief that sleeping with plants was not beneficial. However, if you prefer to bet on artificial flowers the result will be equally amazing, since right now there are creations so beautiful and so close to reality that will seem natural. So far we have seen ideas to decorate with artificial flowers that resemble as much as possible to the real ones. But, what if we change this? I mean another idea is to decorate with flowers that especially notice that are not natural. Even if your house has enough natural light, the hall, depending on how the house is designed, is usually a bit darker. 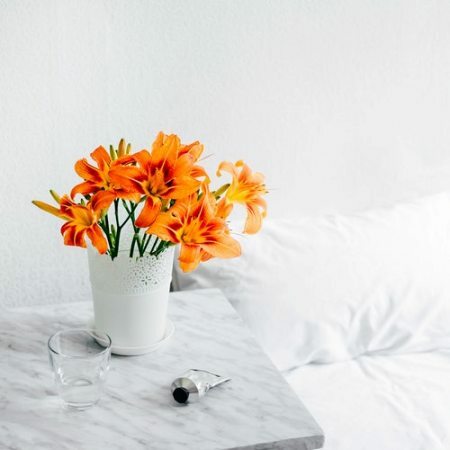 However, it is a space in which the flowers or plants will be very beautiful, welcoming everyone who arrives and filling the entrance to your home with color.